How Resource Intensive is Watchman Monitoring? Pre-release Monitoring Client agent versions and the auto-update process. Support professionals who subscribe to Watchman Monitoring need easy ways to deploy the Monitoring Client at any time. The following are some ideas for making your customized installer available when needed. Unlike the rest of the Watchman Monitoring Dashboard, the installation package for the Monitoring Client does not require login access. Tip: Use a link shortener service to create a shortcut to your installer package. Create a folder named "client" at the root level of your website. Place an index.html file in the "client" folder. When you visit the page created above, the computer will auto-download the latest version of the installer. Creating and auto-download page on WordPress sites. Without a plugin, it is not possible to add Meta tags directly to a WordPress post. A free plugin called "Add Meta Tags" adds this functionality. 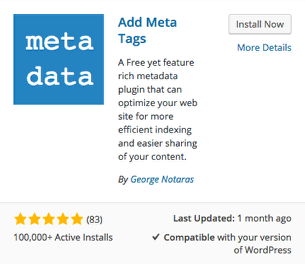 After activating, go to Metadata on the plugin's Settings page and check the box labeled Full Meta Tags then save. Can Subscribers create custom plugins?